Top marks to Buck for their innovation but the hefty Paradigm is nothing more than okay. The Buck Paradigm Pro comes with a 3 1/4″ (8.3 cm) blade, a closed length of 4 3/8″ (11.1cm) and with an overall length of 7.5 inches (19.1 cm). The Paradigm comes in at a reasonably hefty 4.8 ounces which is to be expected for such a stoutly built knife. Make no mistake, this is a substantial knife. With a handle consisting of stainless steel liners, bolsters and blue/black G-10 which has been contoured on a CNC mill and at 1/2″ (1.3 cm) thick it’s not as chunky in the pocket as you’d think. 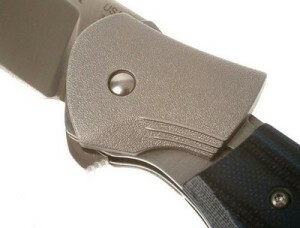 The pocket clip is oriented for left/right tip up carry only and made for deep, concealed carry. As with all of Buck’s higher end knives, this one is made in the USA. The blade on the Paradigm Pro is a very stout piece of S30V. Coming in at 1/8″ thick at the spine, the blade is hollow ground with portion of the blade right behind the edge ending up fairly thin. Out of the box the knife comes with a toothy edge that will slice printer paper fairly easily. The grind of the blade looks very nice but with a quick comparison from one side to another I found the grind lines are not quite even with one another. This difference in grinding depth resulted in a difference in the size of the edge bevels on each side of the blade. This did not have any detrimental effect concerning the sharpness of the blade, but it would pose an issue when trying to re-sharpen the knife over time as a novice sharpener may not notice or understand why the bevels are different in size. With the spine of the Paradigm being as thick as it is, the tip is very robust in general. With so much steel at the very tip it requires a bit more work to remove the steel as opposed to the heel of the blade where it’s quite thin. However this trade off produces a knife that is very good at making slices, and the tip means business when it comes to hard use and some abuse. One would be hard pressed to break off the tip on this knife before the lock would give way. The “BOS” heat treatment on the blade is top notch, having been subject to the Paul Bos heat treating system which is expertly done. For the unaware, Paul Bos was commonly known as a leader in US heat treating until he retired in 2010. He passed the reigns over to Paul Farner who now heads up the HT team at Buck and leverages Paul’s techniques very effectively. The S30V takes a very fine edge and holds it extremely well when put against almost any task. This really is an excellent yet affordable knife steel in today’s ever complex world of alloys. Touching up the knife in spite of the very high wear resistance of the steel is not bad at all due to the fine grain structure that the expert heat treatment has provided. Note that should you want to remove a lot of steel you’d better set aside a whole day if you’re going to use conventional stones. As such, for this kind of knife it might warrant an investment in a couple of diamond stones to get much of the sharpening done, especially if you are the kind of person who goes extended periods between maintaining your knife. The handle on the Paradigm Pro is extremely classy. With stainless steel liners and bead blasted stainless steel bolsters it’s got a real classic feel true to Buck’s unique stylings. Still, with the blue and black G-10 it’s got just enough of a contemporary feel to remain aesthetically interesting and stand out among its peers. With the blade deployed the flipper protrudes on the front of the handle, stopping the hand from coming up onto the edge of the blade accidentally during use. At about 4 inches or so of handle length this knife provides plenty of space for a good grip, however the handle, while very handsome to the eye, does not provide much traction to the hand at all. On top of the smooth G-10 handle with little texture, there’s no jimping to be found on either the handle or spine of the blade. All you have for controlling forward movement on the blade is the flipper on the blade itself. This piece, while effective in providing control, is also very sharp to the touch and in prolonged cutting sessions it eventually causes a considerable amount of discomfort to the user. In addition, the lack of traction causes the user to have to grasp the knife a bit more firmly and while the handle has a nice texture, there are edges that are rather sharp that become uncomfortable under extended periods of use. This Paradigm Pro utilizes Buck’s Shift Mechanism™ and ASAP™ opening technology. The Shift Mechanism is similar in style to a button lock but instead of a button it is activated by sliding the bolster a few degrees off from its base position. This allows you to activate the flipper and the spring assisted ASAP™ opening mechanism makes the blade fly out extremely fast and secure. The bolster then is slid back to its original position and the knife is locked open. While I didn’t take it apart to see the mechanisms holding everything together, the knife feels very secure and there is little to no blade play up, down or side to side. The deployment is very nice and the Shift mechanism while a bit odd works very conveniently, keeping the blade securely closed while in pocket and not getting in the way too much when opening or closing the knife. With just a few minutes of practice you’ll be able to unlock the safety, flip the blade out and lock the safety in as much time as it takes to open a regular style flipper knife. Word of warning… if not careful there is a risk of mistiming the application of the lock and opening of the blade, resulting in the blade not locking open which could result in a laceration hazard. The main problem I found with the design is its inherent complexity. Besides voiding the warranty, the main reason you’ll never want to try to take this knife apart is that the internal mechanisms are very hard to re-assemble. Fortunately, the knife comes tuned up and in very good working order. The fit and finish on the Paradigm Pro is kind of a mixed bag. The bolsters have a beautiful and consistent bead blasting of sorts that is very handsome and the finishing is top notch, as with the G-10. On the flip side, the stainless steel liners protrude past the G-10 scales instead of being flush with them. Also, the edges of the liners are not chamfered or rounded off in any way, making them fairly sharp and uncomfortable. That said, the finishing work and detail on the handle certainly is consistent and was intended that way. The blade is another story, however. While most of the blade has a beautiful and consistent finish on it, there are differences in the grinds on each side of the blade where one side seems to be ground either less so than the other side, or held against the hollow grinding wheel at a different angle. This lack of perfect symmetry is clearly a flaw, causing an edge bevel which is uneven. The knife came with the blade resting dead in the center of the handle scales, a very good indication of quality. Most of the hardware on this blade has also come nicely finished and consistent throughout the piece, even on areas that aren’t going to be noticed unless the knife were to be taken apart or thoroughly inspected. One exception to this was the sloppy grind marks on the flipper mechanism between the heel of the blade and the handle. It just looks shoddy and poorly finished. In that same area the blade lacks any sort of sharpening choil and has a bit of a recurve due to inability to sharpen all the way up to the heel of the blade. Again, overall it’s a real mixed bag when it comes to fit and finish on the Paradigm Pro. After carrying and using the Paradigm for a while now it has served its purpose as a functional EDC pretty effectively. It keeps a decent edge while cutting boxes, zip ties and all kinds of things one would use an EDC for. The primary problem lies in the fact that this knife has a blade built for heavier use, but the rest of the knife doesn’t fit that same profile. For a heavy use EDC you’d expect a handle with a lot more traction. The thickness of the spine on the blade inhibits cuts into thicker materials as it causes a bit of binding from the hollow grind. However for as thin as the knife is behind the edge shallow cuts are no trouble at all. I liked how the knife opened very easily with just one hand and closing the assisted blade with one hand is not too bad either. 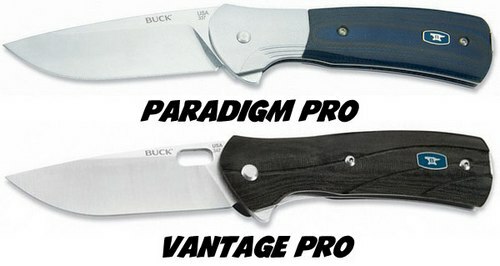 The Buck Paradigm is also offered a lower-end “Avid” model with 13C26 steel and all-black handle. However, I suspect most of you will be wondering how the Paradigm Pro stacks up against the similar Vantage Pro. Well, to be honest I prefer the Vantage Pro which is considerably cheaper, lighter and features a liner lock. It’s the same size but it’s not an assisted opener and in many ways that’s what you’re paying for in the Paradigm. 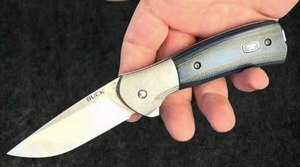 The Buck Paradigm Pro is a valiant effort at making a moderately priced “Luxury” folder for the common man. While it’s novel concept for a locking mechanism functions very well, I worry a little that it’s complexity is susceptible to failure and many would prefer a more common ‘tried-and-tested’ locking mechanism. The form and function of the knife is decent but misguided with the overbuilt blade on a knife ill-suited for work that would justify a blade so robust. The strange locking mechanism also inhibits the owner from performing a thorough cleaning and maintenance, thus diminishing the public appeal for such a blade. Kudos, however to Buck for their innovation in a design that stands on its own. The features and specs in this price range along with the unique locking mechanism leave little to compete directly. All in all the Paradigm Pro by Buck is a worthy effort at making an interesting and unique idea come to fruition but it simply does not have that “It” factor to make it a classic.